This is an extremely easy appetizer or meal that is much healthier than the fried alternative. The cut of meat is very economical and with a few additions will taste spectacular! There are three important techniques to making this cut of meat wonderful – purchase fresh, good quality meat that is not in your freezer section, use a Dutch oven or something similiar (mine is a hand-me-down from my mother), bake them and use the proper ratio of sauce to drummetts. If choosing to make as a meal round it out with Baked Crisps and Dip or Baked Waffle Fries. Follow the technique below for a perfectly simple and delicious dish! Spray Dutch oven with non-stick spray. 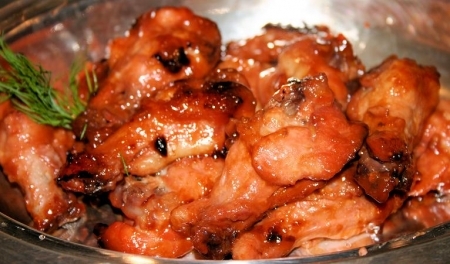 Add ingredients stir gently, cover and bake in a preheated oven at 375 degrees for about an hour or until the meat easily comes off the bone and the sauce has formed a glaze on the drummettes. Serve with a blue cheese dressing, ranch dressing or eat as is. Lemonade, ice tea or Watermelon Cooler that kids and adults alike will love! Try a beer from Summer Flight by the Samuel Adam’s Brewery, Saint Arnold Fancy Lawnmower (Houston, TX), Alexander Valley Vineyards® dry ROSÉ of SANGIOVESE (Sonoma County) or Domaine De Ricaud Bordeaux Clairet (France). Don’t be fooled by the pink color of the dry rosé wines – they are not sweet and are a perfect match with BBQ!